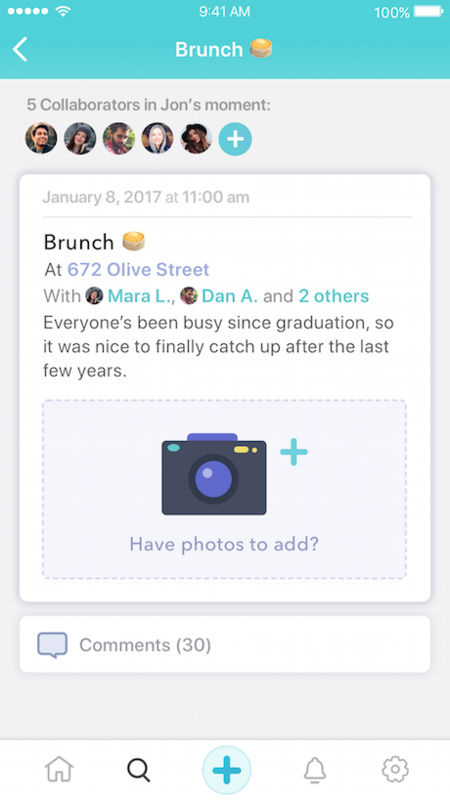 Fabric automatically creates a timeline of your life events by using your phone's location features, accelerometer, and photos. It can identify visits to publicly-listed places or private places you add. You can then add photos and memorable quotes, record the people who were there, so you never forget the things you want to remember. You can also import posts you've made from Facebook and Instagram to add to your digital journal. Fabric uses this information to create interesting aggregate visualizations of your experiences that may include cities you've visited or restaurants you've been to. Do you ever forget things? Fabric is a great resource for anyone who wants to remember more. It can help you remember all the places you've visited and all the people you've met in your life. It's a way for you to document your most precious memories in fun and easy way. Why does Fabric require location? 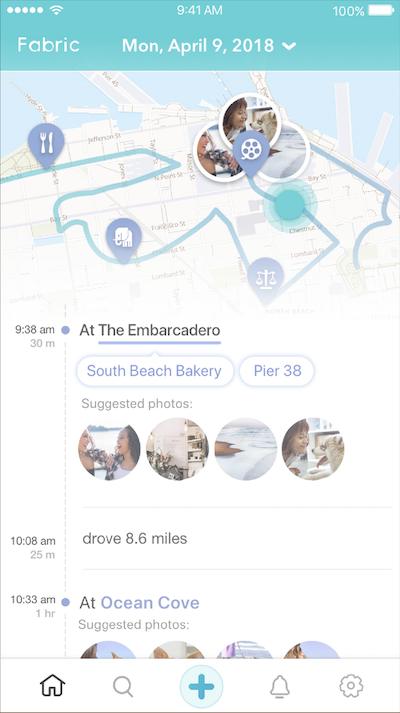 Fabric uses location to segment the way you spend your time. Location is a great way to help remember events and keep track of time. While Fabric is most useful with location turned on, you can always pause tracking for a while or turn it off entirely. For more information, see Settings and Privacy. How do I create a moment? To add a new Moment, tap on the “+” on the bottom of your screen. 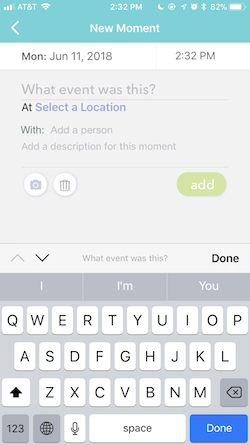 You can privately add details to your events such as where you were and who you were with. To tell Fabric who else was there, enter their name in the “With” section. You can also add any other details like where you went, photos you took, and what happened. When you're done, press “Add” on the bottom right to add it to your Timeline. Fabric automatically creates some moments from your location history. Fabric can analyze where you go in order to create a complete picture of any specific day. When you are around people that you have approved as friends, Fabric automatically tags them in moments it creates for you. Over time, you can construct a page for your relationship simply by spending time together. You can choose to import history about your life that is aggregated in other sources. 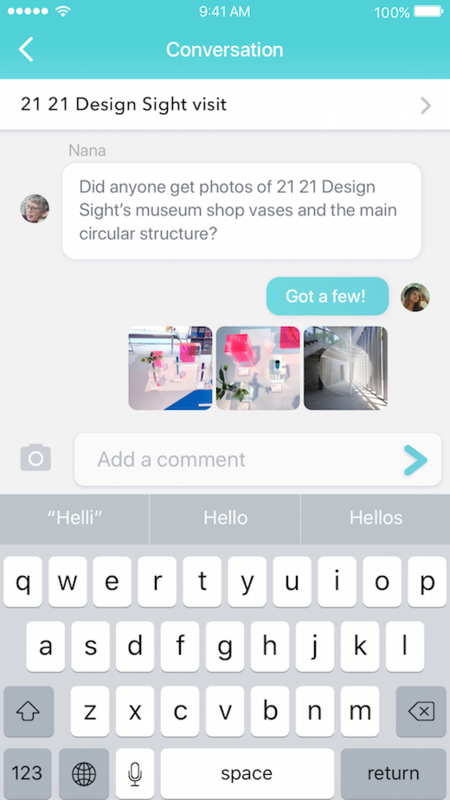 Fabric currently supports your Facebook, Instagram, and Camera Roll. 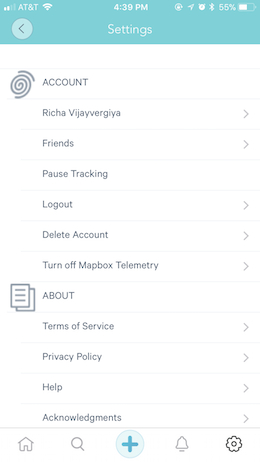 Once you connect your Facebook account, Fabric can index your posts by location as well as by people you spend time with. As of May 2018, Facebook has restricted the ability of apps to see other friends in your posts. To import your Facebook history with people, you now have to invite them to Fabric. Once you connect your Instagram account, Fabric can index your posts by location and then access them through your Timeline or through Search. There are currently two ways of adding photos in the app: through suggestions and manually. The small circular photos on your Timeline are suggested photos that you can add to your Moments. Think of them as your camera roll. They’re private, not uploaded, and will disappear if you delete them from your phone. This also means that if you change your phone, these circular photos will disappear or change, depending on the photos on that phone. You can save them to your journal by tapping on these suggested photos, selecting which ones you’d like to add, then tap on save or update. Photos are not uploaded and saved to your journal until you have manually added them. This means you can select which of the 49 selfie attempts you would like to add to your journal. To manually add a photo to a Moment, tap on the camera icon while editing a Moment in Timeline or on the Moment's own page. How do I edit a Moment? On this screen, you will be able to change the date and time. You will also be able to change or add a title, location, friends, and a description. On the Explore page, you can see all the people and places you've interacted with throughout your lifetime. Home shows your current Timeline and a map of where you have been for the current day. You can browse through your previous days by scrolling up through your Timeline. 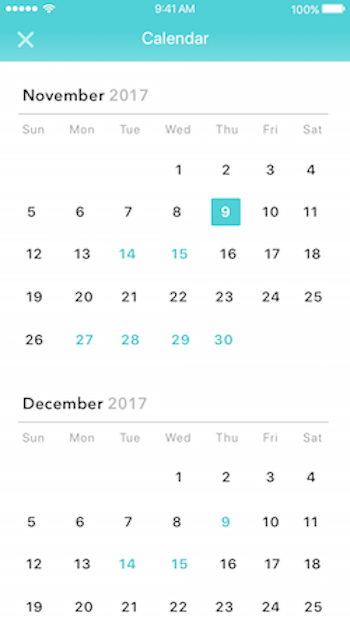 If you're looking for a specific date, you can use the calendar which is found if you tap on the top of the Home screen. Through the calendar, you can tap to switch to a different day-whether that be a week or a year ago. Through the Search bar, you can search for any specific person, place, or memory that has been documented on Fabric. During the week, as you go through your day, Fabric helps you remember your travels. At the end of each week, you’ll get a “Week in Review” which is a summary of your week. The more you add to your journal, the more comprehensive your summary will be. Friends are Fabric users that you have approved to be your friends. They can be auto-tagged in your moments unless you turn it off. People are any people you've met in your life. You can privately tag them yourself or import them from other sources without them being notified. As in life, all friends are people, but not all people are friends. How do I collaborate on moments? For every moment you add, you have the option to add collaborators to the moment. That way, you can share pictures from that event and even message each other about it. You can invite collaborators through your list of people on Fabric. They'll be able to see and add photos to the moment you created. That way, this moment will also show up in their own Fabric journal. Your journal is private, but you can give others access to your moments by adding them as collaborators. You get Notifications if you're invited as a Collaborator to a moment or tagged in moments with your friends. The purpose of Conversations is to talk about moments with the people you shared them with. You can share pictures and talk to other collaborators for moments to discuss life events. 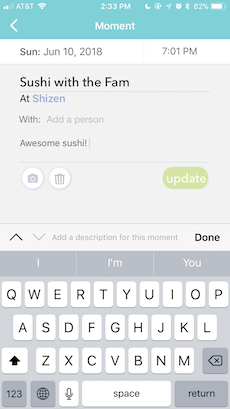 This view let's you keep track of moments with activity. How much battery does Fabric consume? We have prioritized minimizing the impact Fabric has on your battery life, taking advantage of significant improvements in iPhone hardware and software technology to bring down battery usage. In our tests with typical background usage, we have found it to consume less than 5% of your battery as measured by iOS. Fabric is designed to be private by default. You can use it as an individual without connecting with other friends. The only way for people to have access to any of your moments is if they are Collaborators for that moment, or if auto-tagging is enabled and you are at the same place together. You also have the option of deleting moments from your Timeline if you do not want to include them. 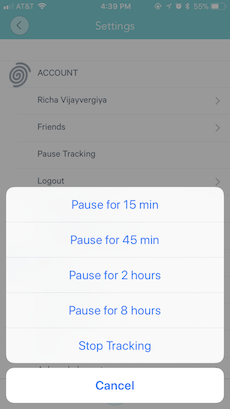 You have the option in your Settings page to pause automatic moment logging and set how long it is enabled for. This is an option on the Settings tab. It will delete your whole account and all the information you provided. Didn't find your answer? Email us your questions and we'll see how we can help. If you have any comments or suggestions for improvement, please let us know.